Before family, friends, and fellow cadets, Elisabeth Veen raised her right hand to take the oath of office. The newly commissioned lieutenant felt her eyes brim with tears this past spring as she received her first salute. The ceremony on the Iowa campus marked an important milestone not only for Veen, but for the UI Army ROTC program, which welcomed her as the first female battalion commander in its 138-year history. Veen,11BA, never expected to be selected as commander during her final semester at Iowa. Despite always being driven by a strong sense of duty, she didn’t seek the honor—in fact, she was afraid she wouldn’t be good enough. Yet, officers recognized her strong academics, fitness skills, and the respect she earned from her peers. 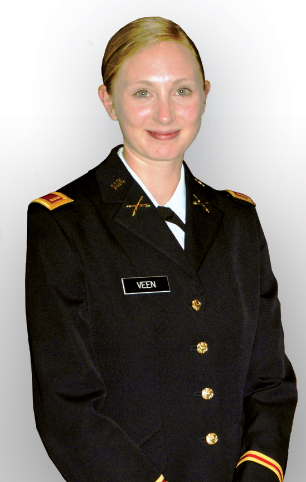 So, from working quietly behind-the-scenes, Veen transitioned to guiding the male-dominated UI ROTC group. She ran training exercises for 100 cadets, worked to improve the program, and served as the face of the Hawkeye Battalion. Instead, Veen joined the junior reserve officer training camp in high school, where she met the officers who would later give her oath of commission and first salute. They also inspired her to influence other young people in her new role at Warrior Forge leadership and development camp in Fort Lewis, Washington, where she trains college-age recruits to respect cultural differences and build relationships with people from different countries, religions, and backgrounds. The small-town Iowa native, who minored in Arabic at the UI and studied abroad in Egypt, hopes to broaden her students’ perspectives—much like her experiences at the university changed her life.